Last night, with slightly more than an hour to go before the deadline of the MMU Novella Competition, I finally finished my novella The Year of the Whale. The image above is a randomised cloud of the most common words in the manuscript, which is a really satisfying way to look back on what I’ve made. I started writing it in 2009, and it has spent entire years untouched, waiting for attention in the dusty recesses of my hard drive. It’s written in first person with a very particular voice, and it’s been strange to return to it so sporadically over the years, and take up the mantle of that voice again. I’ve wanted to finish it for a long time – it was one of my New Year’s resolutions, no less – and I’m thankful to the competition for giving me the spark to get it done. I don’t expect anything to come of it – that way madness lies – but I’m thrilled to have wrapped it up last. The Year of the Whale is the story of a man called Henry Cowx. He is a fisherman and walking guide in Morecambe Bay, riddled with arthritis and wracked with guilt. His story explores that guilt, and gives some quiet thought to what it means to remember. It’s about walking and place and ghosts and folk tales, and our connections with the land. It’s at the heart of my obsession with threshold spaces. It’s a meditative, elegiac story, and a long way from where I’d like to develop my work – but Henry has never been far from my mind, and I’m glad to give him closure at last. I discussed some of the genesis of the story in my Thievery post for Kirsty Logan. I’m working my way through some film jobs at the moment, but it’s almost time to get back into The Hollows. I’m honoured and delighted to have contributed a post to Kirsty Logan‘s long-running series of story inspirations, Thievery. It’s entirely possible to drown yourself in the wealth of stories Kirsty has curated, and I thoroughly recommend you do. For my post, I confessed about a novel I abandoned at 50,000 words, because I no longer knew what it was about. One day, it will be reborn as The Year Of The Whale. Here’s the story so far: Northern Lights / The Year Of The Whale. I’ve talked a lot about wanting to get back to my novella The Year Of The Whale, and I’ve just spotted this novella competition judged by the excellent writer Jenn Ashworth. The deadline is distant enough that I think I can get it finished in time, so that’s now a concrete target for me. In the course of researching and writing The Year Of The Whale, I’ve come across a huge variety of whale material. 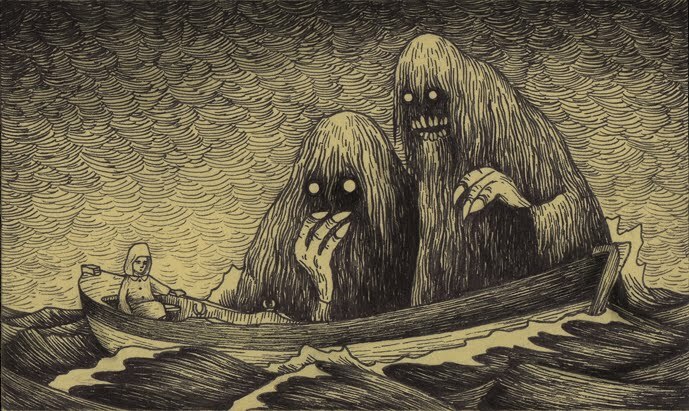 I’ve seen Medieval whales, drawn as dragons and devils, and countless images of beached whales, spilling themselves in streaks onto the shingle. And then there’s much weirder stuff, like this profoundly sad, surreal animation. It’s about childhood betrayal, I suppose, but there’s a lot of other things going on in there at the same time. I would say ‘Enjoy’, but it’s not that sort of film. Okay. So I’m late to the Patrick Ness party, but delighted to be here at last. Agent Sue recommended the Chaos Walking trilogy to me earlier this year, which I read and loved; then my excellent wife Monica gave me A Monster Calls for my birthday. It’s one of the most beautiful books I’ve ever owned, and I’ve been saving it for a time I’m marginally less stressed. I planned to read a chapter or two each night, and really savour it. In the end, I devoured it in a single sitting. It’s one of the most striking, compelling, heartbreaking books I’ve read in a very long time. 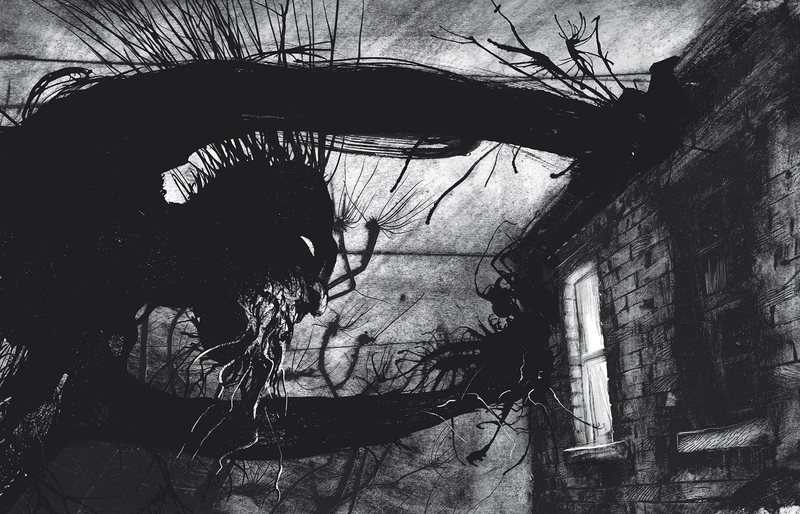 Jim Kay‘s illustrations – bringing almost every page to life – are sumptuously perfect, and Patrick Ness writes with power, precision and grace. The intertwining of artist and writer blurs the boundaries between novels and graphic novels. I think this is also the first book I’ve read that utterly defies ebooks. The story would be the same on a Kindle or Nook, of course, but there’s no way of electronically mapping this sort of paper book; the weight, the feel of the paper, the shape of the book, the stark integration of a full-page illustration with a page of a text. It’s an experience, and it’s simply beautiful. Read it. BigCharlie Poet (the nom de guerre of Simon Hart) and I have been trying out a picture-based flash fiction vs. poetry writing challenge. In case you missed it, here’s round one: Cathedrals. I found this one very difficult. With Cathedrals, I had the story in an instant, and writing was a cruise, but this has taken some working around. I guess that’s the way with writing. I can’t turn it on like a tap. Sometimes the stories shimmer into view as though they’d been there all along, and sometimes they come word by word, kicking and fighting, refusing to stay on the page. This one’s been a toughie, and I’ve tried it three times. My first attempt was an illiterate dystopia where an old man found a book he couldn’t read. It spiralled very quickly, and I abandoned it at 600 words. My second attempt was about a haunted library, and that was a little better – I think I can rescue it for a short story – but it wasn’t good enough for this, and I hadn’t the heart to stick at it. Having sent that back out into the big wide world, I did feel a little freer, but it wasn’t until I discussed the picture with Mon that I came up with my final idea. She imagined the books dropping away into nothingness, and that was the spark I needed. Time and time again, Mon reminds me of the stories I like to tell the most. She keeps me on track when I’m getting lost. With that image in my head, I sat down and wrote the final piece fairly quickly. It’s the middle of something much bigger, I think. I can see this growing into a novella or even a novel, given time. I’m not done with the characters. The creature stepped out of the darkness and into the candlelight. It was smaller and far slighter than Morag, and carried itself daintily, as though it was frightened of breaking a limb. Its tiny eyes were black pinheads in the cloth. It had a ragged hole for a mouth. It smelled like coal sheds. It led her to a door. “In here, my pet,” it lisped. When it talked, stuffing spilled from the corners of its mouth. In jerky, spastic movements, it opened the door to the library, and daylight spilled into the gloom. Squinting in the light, Morag peered beyond the creature and saw a vast room. 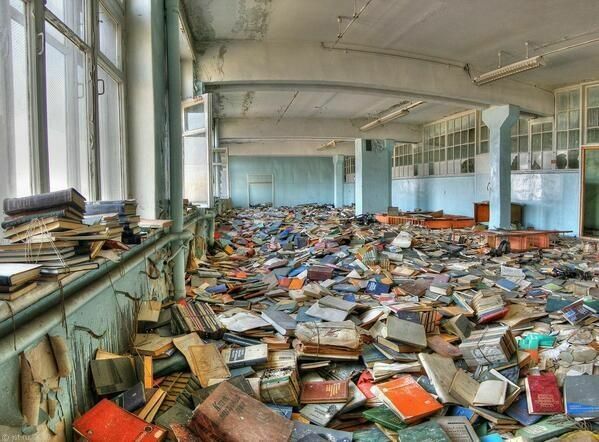 The floor was entirely carpeted in books. Books, books and more books, gathered in loose stacks, strewn by the dozen, piled up in the corners. “All of them?” she whispered. The creature’s smile wrapped around its head. Morag heard stitches popping as it grinned. “All of them,” it said. It turned the hourglass again, and the sand began to flow. Morag slung her knapsack, took a deep breath and brushed past the creature into the library. She stumbled to the top of a nearby stack and surveyed the room. The door creaked shut behind her, and the creature’s smile receded to a single line as it melted into darkness. She was alone in the library. Before her, books lay scattered in their thousands. “But where to start?” she murmured. She took a single step, and then she heard the slithering. It was so faint at first, ghostly whispers, but gathered to a rush. Morag scanned the room. The books in the middle were moving. They revolved, and more volumes fell inwards as they shifted, gathering momentum. They spiralled, forming a circle and starting to drop into the floor. It was spreading outwards, increasing speed. It was a whirlpool. With a jolt, the stack beneath her shifted, throwing her to the ground. Morag fell headlong into the torrent. The daylight closed overhead, grey and fluttering with loose pages. Books battered and struck her as they ground and jumbled in the gyre. The movement was inexorable, dragging her down, dragging her into the centre. Her feet lost contact with the floor and then it all dropped away and Morag was falling, flying, plunging into nothing as the books tumbled all around her. She panicked, flailing and groping for contact, anything to arrest her fall. There was nothing to hold on to. The space beneath her and around her was empty entirely, a sea of nothingness stretching on forever. Books fell around her like rain, covers flapping and pages rippling. As they fell, Morag realised they looked exactly like the sand in the timer. In a heartbeat, she remembered what Badger told her: about time. About the creature. About this place. She took a deep breath, shut her eyes, and reached out. Her hand closed around a book. Still falling, she opened her eyes, and turned to the first page. Morag began to read.